Sir Hugh Cortazzi has been a guiding force in Anglo-Japanese relationship for well over six decades. 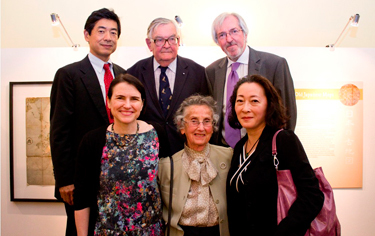 Former British Ambassador to Japan, he has been one of the most dedicated and passionate supporters of the Sainsbury Institute since its inception in 1999. The Institute is hugely indebted to Sir Hugh for his generosity over the years both in his time and material wealth as he has donated much of his personal Japanese ceramic, antique map and rare book collections to the Institute. The collections are in their own right worth future academic investigation. 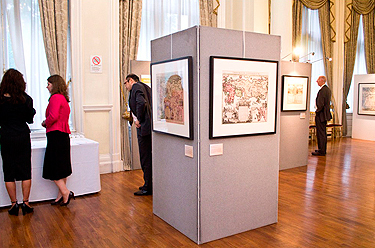 The maps in particular formed the core of the 10th Anniversary celebration of the Lisa Sainsbury Library where we held a special exhibition at the Embassy of Japan this summer. Here, he reflects back on his involvement with Japan and later the Institute. What inspired you to develop your lifelong connection with Japan? At St Andrews University where I studied from 1941-1943 my main subjects were French and German. After the war with Japan began in December 1941 it became apparent that Britain had a serious lack of Japanese linguists and when I joined the RAF in May 1943 I was assigned to study Japanese. After serving in India and Singapore I was sent in the summer of 1946 to Japan to join the British Commonwealth Occupation Force and worked in Iwakuni and Yonago in western Japan. I was intrigued by the complexities of written Japanese and pleased to achieve a competence in the spoken language. But I realized from the outset of my studies that if I was to begin to understand modern Japan I needed to study Japanese history, religion and Japanese culture including literature and the arts. So when I was demobilized at the end of 1947 I returned to the School of Oriental and African Studies (SOAS) in the University of London to pursue my Japanese studies. After graduation in 1949 I joined the British Foreign Service, which later became the Diplomatic Service. I was posted four times to the British Embassy in Japan first as Third/Second Secretary (1951-1954), then as First Secretary (1961-1965), Counsellor (Commercial and Economic) 1966-1970, and finally as Ambassador (1980-1984). 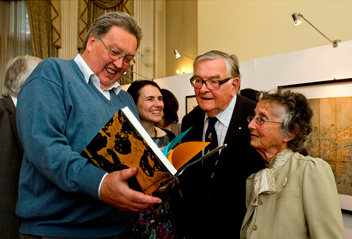 Sir Hugh and Elizabeth Cortazzi with Nicole Rousmaniere. Over the years I read as widely as I could about Japan. I became particularly interested in Japanese history and Japanese arts. My first translations of the humorous short stories of Genji Keita were published in 1971. My next publications did not appear until 1982/83. While in Japan and in London my wife and I became fascinated by antique maps of Japan made by both western and Japanese cartographers. As Chairman of the Asiatic Society of Japan I felt obliged to offer a lecture to the Society. I chose to speak about old maps. This led in due course to what is my favourite publication Isles of Gold: Antique Maps of Japan, which appeared in 1983. During our postings to Japan and on subsequent visits we became collectors of Japanese artifacts including ceramics, prints and books. We met many Japanese potters and became a friend of the late Shimaoka Tatsuzo a Mashiko potter who became a living national treasure. On my retirement from the diplomatic service at the age of sixty in 1984 I was employed as a director and adviser to various companies, British and Japanese. This gave me an opportunity to continue visiting Japan. In 1985 I became Chairman of the Council of the Japan Society, which had been founded in 1891. We decided to celebrate the 100th anniversary of the establishment of the Japan Society by holding a large scale Japan Festival in the United Kingdom in 1991. The Festival was the occasion for many art exhibitions and saw the establishment of the Kyoto garden in Holland Park. I was closely associated with all these events, which served to deepen my knowledge of and interest in Japanese culture in its many manifestations. My study of Japanese history made me realize the extent and depth of the relations between Britain and Japan. In 1991, the same year as the Japan Festival in the United Kingdom, I initiated the idea of producing studies of British and Japanese personalities and organizations, which have contributed over the years to this relationship. The first volume in this series was published under the title Britain and Japan, 1859-1991, Themes and Personalities and was edited by me and Gordon Daniels. Since then eight volumes under the title Britain and Japan Biographical Portraits have been published. I have edited five of these volumes and contributed to all of them. The series is unique not least because nothing similar has appeared in other countries with close relationships with Japan. It became clear to me during and after the last war that our relations with Japan were sometimes vitiated and often prejudiced by inadequate public understanding of Japan and its culture. Stereotyped images of Japan (Mount Fuji and Cherry blossom on the one hand and simian-like portrayals of brutal Japanese soldiers on the other) exacerbated the trade tensions, which developed as the Japanese economy recovered and the British declined. Historical image exhibition at the Embassy of Japan. If prosperous and peaceful relations were to be developed on the basis of shared mutual interests we needed to know much more about Japan. Japanese studies had hardly existed in Britain before the Second World War. They had to be expanded and developed. Much has been achieved and I am proud that I have been able to assist in this development. Every year books and articles about Japan and its culture are now published in Britain. Japanese investments in Britain have helped to revitalize sections of British manufacturing and reestablish Britain as a major producer of cars. Japanese businessmen have become an important element in the prosperity of the City of London. Japanese musicians play in most of our orchestras. Japanese artists and novelists are acclaimed throughout Britain. The image of Japan has been transformed. But we must not be complacent. In both Britain and Japan prejudices have not been entirely eliminated. Nationalism can pose a threat to mutual understanding and we must always be wary of latent animosities. You have been a wonderful patron of the Sainsbury Institute from its creation. Can you tell us how you have engaged with the Institute over the years and whether you are happy with how we have evolved over the years? My wife and I have enjoyed collecting Japanese books and objects over the years. We do not want to sell them and want them to be used and displayed in ways, which may help to promote knowledge of Japan and its culture. So we decided some years ago that we would give or bequeath all our Japan related items to an institution, which could make good use of them. We chose the Sainsbury Institute not only because its objectives seemed to be in line with our own, but also because it had suitable premises in Norwich and had the Lisa Sainsbury library with a dedicated full-time Japanese librarian, Mr Hirano Akira. We became friends with Nicole Rousmaniere, the first director of the Institute, and enjoyed many visits to the institute where we were received by the friendly and knowledgeable members of the Institute’s staff. I am particularly pleased that on the initiative of the Sainsbury Institute, Japanese language studies have been added to the curriculum of the University of East Anglia. I hope that this venture will prove successful for many years to come and that the Institute will continue to underpin and promote Japanese studies in general. The work of the Institute in promoting research into Japanese arts and cultures is of course fundamental and I hope that we shall see more Japanese researchers coming to Britain in the future, but Britain also needs its own experts in the history of Japanese arts. In due course I hope that the Institute can develop a series of courses, long and short, for British and foreign students wanting to study specific aspects of Japanese culture including the arts. Sir Hugh and Elizabeth Cortazzi. I attach importance to the development of Japanese studies at UEA so that students will be able to learn about and understand the life of the Japanese people whose language they are studying. This means including in the curriculum the study of Japanese history, literature and art. I hope that the Institute will expand its publication programme so that a Sainsbury Institute imprint becomes well known in the academic community and draws attention to the work of the Institute in the study of and research into Japanese arts and cultures. It would be good if resources could be found for the publication of a regular journal, perhaps quarterly in the first instance, recording the work of the Institute and containing contributions from researchers, scholars and students of Japanese arts and cultures. An exhibition of Yokohama-e of British subjects. This would highlight the close connections between Japan and Britain in the Bakumatsu era and would include prints showing British men and women, the buildings they used and the British role in the development of the first railways in Japan. These prints, which were produced while photography was in its infancy, demonstrate the continuing skills of Japanese print artists. An exhibition of representative contemporary wares from kilns around Japan including Bizen, Hagi, Karatsu etc. We donated a large number of pots to the Institute, which have not yet been exhibited. I realize that these suggestions present various challenges including finding suitable locations, curators and finance, but I hope that these ideas can be explored. What do you think the future entails for Japan? All developed countries face difficult challenges in the twenty first century. Some of the problems faced by Japan are unique to Japan or especially difficult for the Japanese people. The most difficult issue for Japan in the next few decades is how to cope with a declining and ageing population. This problem is exacerbated by continuing male dominance in the work force and the society at large, and innate opposition to immigration due to a mistaken belief in Japan’s ethnic uniqueness. Much more needs to be done to overcome prejudices about women’s roles at home and at work. Abenomics will, I hope, be successful in extricating Japan from deflation, although success cannot be guaranteed. Japanese national finances are in a dire condition and cannot be put right solely by increasing the consumption tax. It remains to be seen whether opposition from vested interests to the necessary reforms, which are supposed to constitute Abe’s ‘Third Arrow’, will be overcome. Japan’s education system was much admired but its weaknesses are now becoming more apparent. Very few Japanese universities are among the top one hundred world universities. Japanese technology remains among the best in the world and there are many able Japanese scientists, but many of them are working in the United States. While young Japanese went abroad to study in the early years of Meiji, they now seem reluctant to go far from home. Japanese businessmen abroad are more often than not tanshin funin (unaccompanied by their wife and family). This means that few integrate adequately into the country where they are working. The structure of Japanese employment is often not conducive to the encouragement of entrepreneurship. The corporate governance of many Japanese firms is weak and loyalty to the firm, right or wrong, seems to be regarded as the paramount virtue. Japan is not unique in having a large number of NEETS, but it is doubtful whether the Japanese government and Japanese society have yet come to grips with the problem, let alone found ways to solve it. Japanese agriculture needs urgent reform. But the agricultural lobby has too much power. Japan must push forward its efforts to join the Trans Pacific Partnership (TPP) and rebalance away from rice farming. Japan has few natural resources and has to import almost all its oil and gas. To reduce dependence on such imports, nuclear energy was developed so that until the Fukushima nuclear disaster in 2011 some thirty per cent of Japan’s electricity was provided by nuclear reactors. Since the disaster all nuclear plants have been shut down for safety tests. This has pushed up energy costs. Pressure from industry for restarting nuclear plants has met strong popular opposition, as there are real fears of another nuclear disaster in a country prone to suffer earthquakes and other natural disasters. In foreign policy Japan must do more to put its relations with China and the Republic of Korea (ROK) on a better footing. The simmering dispute with China over the uninhabited Senkaku Islands is a distraction from the much more important issues of trade and investment. The dispute with the ROK over Takeshima Island is far less important than the task of ensuring that Japanese companies can compete effectively with the big Korean companies (Chaebol) such as Samsung. Japanese nationalism over these disputes is a threat to peace and to Japanese national interests. It must to be kept in check. The rogue state of North Korea remains a potential threat to the security of Japan and Japan will have to remain on the alert so long as the regime lasts. Japan must continue to rely on its alliance with the United States and a way must be found to deal with the problem of US bases in Okinawa. Japan is an important member of the G7 and plays an increasingly significant role in the councils of the western powers. It is important for Japan and the democratic countries of the world to work together in the United Nations and other world institutions to maintain peace and increase world prosperity through freeing trade and extending aid to developing countries where such aid can be usefully employed. There has been much discussion in Japan about possible revision of the 1947 Constitution and especially of Article 9 renouncing war. But constitutional revision is not a necessary precondition for Japan to take a more active role in supporting UN peacekeeping. The danger of nationalist elements hijacking constitutional revision exists but should not be exaggerated. Japan has much more important issues to solve and should not be diverted from these by constitutional controversies. Democratic institutions are firmly established in twenty first century Japan, which will enable Japan to meet the various challenges that I have mentioned, and while anti-democratic elements exist on the right and left of the political spectrum they do not pose a current threat to Japanese democracy. It is important that we do all we can to develop contacts between British and Japanese people and try to ensure wider understanding of the problems, which both Britain and Japan face in the twenty first century, so that the two countries can work together in tackling them. Studies of Japanese history, culture, art and language can contribute to the corpus of knowledge about Japan. Seminars, meetings and visits by scholars play an important role in bringing people together and fostering mutual understanding.